CCEdit 2.0 "no tilesets found" - Programs and Editors - CC Zone: The Next Level - Chip's Challenge/Tile World website! I recently migrated from an old laptop to new one (both Mac), and CCEdit no longer opening, I'm getting the attached - "Error: No tilesets found. Please check your CCTools installation." I try to reinstall from the package but get that installation warning which makes me nervous as hell about messing up my new system. What version of macOS are you using? 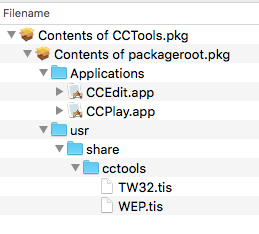 CCTools is 32-bit, and Mojave is the last version to support 32-bit software. This also breaks Tile World. If your macOS version is too recent, the only way out may be to install another operating system, or maybe compile from source (I have no idea if the latter one would even work though).